Knowing who is taking what action on which item in your Power BI tenant can be critical in helping your organization fulfill its requirements, such as meeting regulatory compliance and records management. Use Power BI auditing to audit actions performed by users, such as "View Report" and "View Dashboard". You cannot use auditing to audit permissions. You work with auditing in the Office 365 Security and Compliance Center or use PowerShell. Auditing relies on functionality in Exchange Online, which is automatically provisioned to support Power BI. You can filter the audit data by date range, user, dashboard, report, dataset and activity type. You can also download the activities in a csv (comma separated value) file to analyze offline. You must either be a global admin or be assigned the Audit Logs or View-Only Audit Logs role in Exchange Online to access the audit log. By default, these roles are assigned to the Compliance Management and Organization Management role groups on the Permissions page in the Exchange admin center. 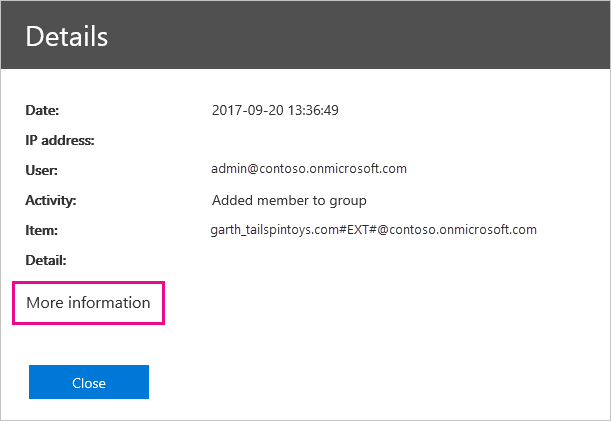 To provide non-administrator accounts with access to the audit log, you must add the user as a member of one of these role groups. 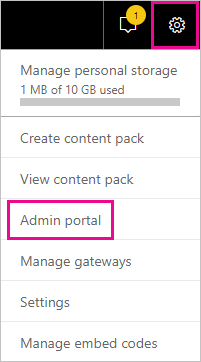 Alternatively, you can create a custom role group in the Exchange admin center, assign the Audit Logs or View-Only Audit Logs role to this group, and then add the non-administrator account to the new role group. For more information, see Manage role groups in Exchange Online. If you can't access the Exchange admin center from the Microsoft 365 admin center, go to https://outlook.office365.com/ecp and sign in using your credentials. If you have access to the audit log but are not a global admin or Power BI Service admin, you will not have access to the Power BI Admin portal. In this case, you must use a direct link to the Office 365 Security & Compliance Center. To access logs, first make sure that logging is enabled in Power BI. For more information, see Audit logs in the admin portal documentation. There can be up to a 48 hour delay between enabling auditing and being able to view audit data. If you don't see data immediately, check the audit logs later. There can be a similar delay between getting permission to view audit logs and being able to access the logs. In Power BI, select the gear icon in the upper right, then select Admin portal. Select Go to Microsoft 365 admin center. Restrict results to only Power BI activities by following these steps. For a list of activities, see the list of activities audited by Power BI later in this article. On the Audit log search page, under Search, select the drop down for Activities. Select anywhere outside of the selection box to close it. Your searches will now be filtered to only Power BI activities. You can search the logs by date range using the Start date and End date fields. The last seven days are selected by default. The date and time are presented in Coordinated Universal Time (UTC) format. The maximum date range that you can specify is 90 days. An error is displayed if the selected date range is greater than 90 days. 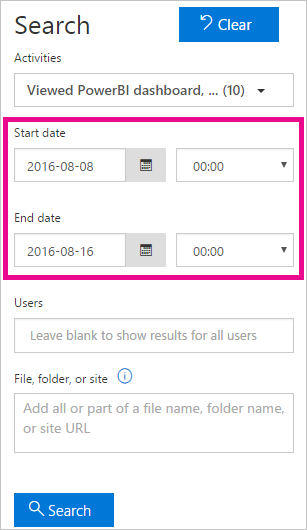 If you're using the maximum date range of 90 days, select the current time for Start date. Otherwise, you'll receive an error saying that the start date is earlier than the end date. If you've turned on auditing within the last 90 days, the date range can't start before the date that auditing was turned on. You can search for audit log entries for activities performed by specific users. To do this, enter one or more user names in the Users field. The user name looks like an email address; it's the account that users log into Power BI with. 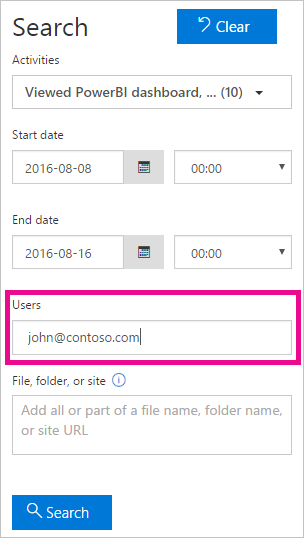 Leave this box blank to return entries for all users (and service accounts) in your organization. After you select Search, the search results are loaded and after a few moments they are displayed under Results. When the search is finished, the number of results found is displayed. A maximum of 1000 events is displayed, If more than 1000 events meet the search criteria, the newest 1000 events are displayed. The Results area contains the following information for each event returned by the search. Select a column header under Results to sort the results. Date The date and time (in UTC format) when the event occurred. IP address The IP address of the device that was used when the activity was logged. The IP address is displayed in either an IPv4 or IPv6 address format. User The user (or service account) who performed the action that triggered the event. Activity The activity performed by the user. This value corresponds to the activities that you selected in the Activities drop down list. For an event from the Exchange admin audit log, the value in this column is an Exchange cmdlet. Item The object that was created or modified as a result of the corresponding activity. For example, the file that was viewed or modified, or the user account that was updated. Not all activities have a value in this column. Detail Additional detail about an activity. Again, not all activities will have a value. You can view more details about an event by clicking the event record in the list of search results. A Details page is displayed that contains the detailed properties from the event record. The properties that are displayed depend on the Office 365 service in which the event occurs. To display these details, select More information. All Power BI entries have a value of 20 for the RecordType property. For information about other properties, see Detailed properties in the audit log. To export the Power BI audit log to a csv file, follow these steps. Select either Save loaded results or Download all results. You can also use PowerShell to access the audit logs based on your login. The following example shows how to connect to Exchange Online PowerShell and then use the Search-UnifiedAuditLog command to pull Power BI audit log entries. To run the script, you must be assigned the appropriate permissions, as described in the Requirements section. For more information on connecting to Exchange Online, see Connect to Exchange Online PowerShell. 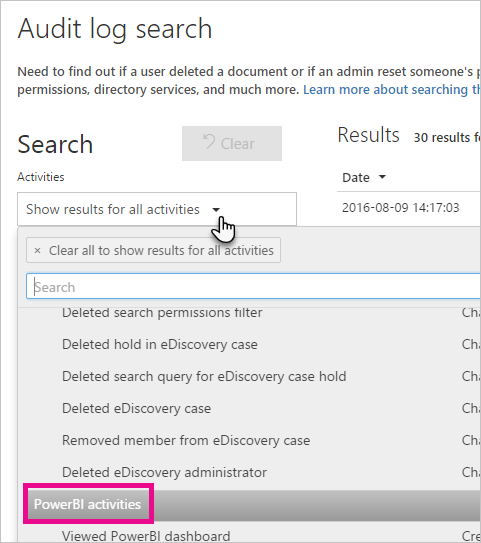 For another example of using PowerShell with audit logs, see Using Power BI audit log and PowerShell to assign Power BI Pro licenses. The following activities are audited by Power BI.